For the fifth consecutive year, the American Platinum Eagle was not offered in bullion format and only a single numismatic version was issued. Although the US Mint had expressed their desire to offer platinum bullion coins for the past two years, production had never resumed after the suspension which had occurred in late 2008. As such, the one ounce 2013 Proof Platinum Eagle represented the only coin issued under the series for the year. The numismatic issue featured the fifth of six designs representing the foundations of American democracy as found in the Preamble to the Constitution. The theme of the design was “To Promote the General Welfare” and featured a depiction of Young America against the backdrop of three interlocking gears intended to symbolize the interconnection of power between the federal, local, and state governments. As in prior years, a bald eagle privy mark was incorporated into the design, this year positioned within the outer rim containing the inscriptions. 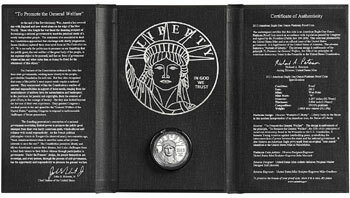 The obverse featured the portrait of the Statue of Liberty, which had been used throughout the series. Sales of the 2013 Proof Platinum Eagle began on July 18, 2013. The United States Mint established a maximum mintage of 15,000 pieces and an initial ordering limit of five coins per household, matching the levels of the prior year. The initial pricing was $1,800 per coin, based on an average market price of platinum within the $1,400 to $1,449.99 range. Throughout the course of the offering, pricing would be adjusted based on the average weekly price of platinum. Initial sales figures for the coin were modest with just over 2,000 pieces sold during the first week of availability. By the end of the year, total sales had reached about 5,000 pieces, accounting for only a one-third of the stated maximum mintage. Ultimately, the coins achieved a sell out on March 12, 2014 at last reported sales of 5,763 pieces. Significantly, this represented a new mintage low for the Preamble design series, well under the prior low of 7,945 pieces established for the 2009 issue.